Anna Parker’s life disintegrates with one phone call. Her dad’s selling their ritzy New York City condo because her Wall Street banker mom emptied their bank account and ran off with another man. Which means Anna has to drop out of her elite college and move with Dad back to their small Ohio hometown. Anna’s determined to reclaim her life ASAP, so she’ll use the next few months to save money, help Dad get back on his feet, and find and confront her mom. Rhonda Helms started writing several years ago. She has a Master's degree in English and a Bachelor's degree in Creative Writing. She also edits for Carina Press (an imprint of Harlequin Publishing) and freelance edits. When she isn't writing, she likes to do amateur photography, dig her toes into the sand, read for hours at a time, and eat scads of cheese. WAY too much cheese. Rhonda lives in Northeast Ohio with her family. 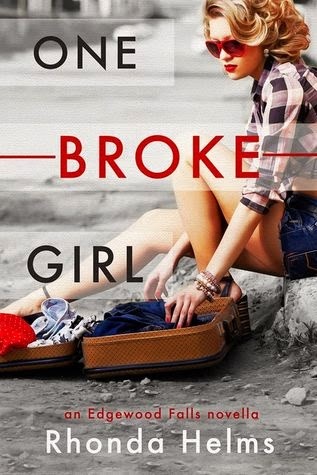 Q: How did you come up with the idea for ONE BROKE GIRL? A: I brainstormed the story in an online writing group, first looking for embarrassing/crazy/weird jobs to help me develop ideas. All I knew at that point was I wanted a heroine working a job she never thought she’d do. When someone mentioned “lunch lady,” the story started writing itself. I realized it was going to be a riches-to-rags story with potential for laughs and heartfelt moments. Q: Who are your favorite New Adult authors? A: Oh man, I go through big reading spells where I devour a ton of New Adult because I can’t quit it. I love the intimacy and immediacy of the narrative. Some of my fav authors are Erin McCarthy, Lexi Ryan, Caisey Quinn, Tammara Webber, Sophie Jordan, Marilyn Brant, Samantha Young, Colleen Hoover… I could go on and on, lol. A: I’m an editor by day, so I typically write in the afternoons or early evenings after my work is done. I write 5-10 pages a day, 5 days a week when I’m in drafting mode. Because I plot out scene by scene beforehand, I can sit down and bang out the story pretty quickly. Q: What’s next in the Edgewood Falls series? A: Book 2 is Natalie’s story, coming out in June. I’m working on it now, yay. Book 3 will be Bianca’s story, coming out in August. And if readers love these books as much as I do, I’ll probably write more in the series. I’m loving these so much. Q: What’s one random/weird fact about you? A: Oh man, I have tons of quirks. Lol. Probably one of the biggest things is I carry at least 2-3 different lip balms on me at all times…in case I have a dry lip emergency or something, I guess. Hah. I can’t quit my lip balm.